Every parent of an acting-out child knows that once your kid has a reputation for being a troublemaker at school, it’s very difficult to undo that label. That’s because your child becomes the label; when the teacher looks at him, she often just sees a troublemaker. Sadly, it’s very hard to change that image, because even when your child tries harder, the label is reinforced when he slips up. And then he’s really in trouble, because not only is he still a troublemaker—now he’s seen as a manipulator, too. We all know that labels are assigned all the time and that they don’t help the problem. Not only are they innately unfair, they are also subjective. In other words, one person’s view of a troublemaker is not the same as another’s. School teachers, being human, will label kids. Make no mistake, teachers talk and are well aware of who the troublemakers are before they get to their class at the beginning of the year. After all, it’s part of their job to anticipate the behavioral issues they will be dealing with in their classroom and try to plan for them. Part of what you have to do as a parent is try to distinguish between the label and your child’s style of functioning in school. So if your child has been called a troublemaker, ask yourself what that means. How does he make trouble? Does he speak out of turn in class? Is he easily distracted and bothersome to the students sitting next to him? Or is he disruptive and rude? I always advise parents to be honest with themselves about their child’s behavior. Yes, it’s important to assert yourself as a parent and advocate for your child at school. But it’s also vital to your child’s development that you not defend him when he’s in the wrong. Make no mistake: defending your child when he has behaved inappropriately will not help him develop appropriate skills and to become right as a person. So if your child is known as a school troublemaker and is disruptive and rude in class, it’s very important that you acknowledge that. Parents need to have an open mind about their children so they can help the school in changing their behavior. Don’t forget, for many parents of kids with behavior problems, it’s easier to fight with the school than it is to change their child. And when you do this, that only succeeds in letting your child off the hook, when in reality what they really need to do is learn how to change their behavior. Whenever possible, though it’s sometimes difficult, parents and teachers need to work in tandem. As a side note, if parents have a problem with a teacher or the school, they should never discuss it in front of their child. Make no bones about it, if you undermine the teacher openly at home, it becomes almost impossible at some later date to get your child to behave appropriately. I understand that parents won’t always agree with their child’s teacher. In certain cases, I thought my son’s teachers had some rules that didn’t make sense. My wife and I talked about it and discussed it with the teacher, but my son never knew it. That was because we were there to uphold the image of the school as an entity that has to be respected—and one in which our son knew he had to behave respectfully. In my opinion, going to school is like having a job. You coach your child through their school career the same way you might give them advice when they start a profession. You can say, “You have to learn to get along. There are going to be good people and bad people. There are going to be good times and bad times. There are going to be people who don’t like you and people you don’t like.” The key is not to eliminate everything your child doesn’t like in life; the key is to help him manage things even when life is difficult. After all, there’s going to be injustice in school and in life, though few parents acknowledge or talk about it with their kids. I think it’s good to say, "That’s an injustice and you’ll have to deal with it." Because in fact, some things really aren’t fair in life, and part of growing up is learning to deal with that fact. When I worked with kids who didn’t get along with their teachers, I would often say, “Look, it’s your job to get along with your teacher, not your teacher’s job to get along with you.” A teacher’s job is to be respectful of their students and to help them learn. It’s not their job to humor kids when they’re in a bad mood or act out. No place does that, so when kids complained about their teachers, I would say. “Whether you work at a gas station or a law firm, your boss and co-workers won’t put up with that kind of behavior. You have to learn how to get along, that’s part of becoming independent.” In fact, some of the most important criteria for independence are “How well does this person manage adversity? How well does he get along with people he doesn’t like? How does he deal with supervisors who are a pain in the neck?” We’re all going to have that in life. So the idea is to give your child the skills to get along no matter who he or she is dealing with. Consequences: Should I Give Them to My Child When He Gets in Trouble at School? Let’s face it: every parent whose child acts out in class gets sick of hearing from the school—even if they know their child is legitimately a problem. Parents don’t want to go to work and hear about their kids during the school day; they want the school to handle it. And the school thinks parents should be more involved in dealing with inappropriate behavior. So when should parents get involved? I think the answer to that is straightforward. In my opinion, it depends on whether the problem is “functional” or “relational.” A functional problem includes being late for class, chewing gum or running down the hall. I think schools should handle those problems; that is their community, and they need to manage it. I personally do not think parents should give more consequences at home for those types of things. But the whole game changes when it comes to relational problems. These are problems that have to do with inappropriate behavior towards people or property. If your child steals, if he’s physically abusive, if he’s threatening, if he gets into a fight, parents need to hold him accountable and give consequences at home in addition to the consequences the school assigns. Again, one of the things parents have to avoid is insulating their child from the natural consequences of their behavior. If your child destroys property or assaults someone at school and you do everything you can to protect him so he doesn’t have to face legal consequences, I think you’re making a mistake. I think you can support your child through those consequences—I would. But the more you insulate him from the natural consequences of his actions, the less likely those actions are going to change. Because let’s face it, people don’t change until there’s pressure to change. And unfortunately, that pressure often comes from negative consequences, whether that’s for a speeding ticket or for being physically aggressive in school. We understand that fact as adults in society: people get tickets all the time for running lights and for speeding. You may not like getting a ticket, you may not think it’s fair. But the bottom line is that it makes you look at your behavior and change it. 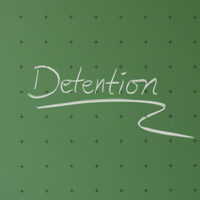 When a child gets in serious trouble at school, many parents become worried that it will go on their permanent record. Is that a legitimate worry for a parent? Yes. But you don’t soothe those worries by sweeping the problem under the rug. Let me be clear: if your child assaults someone at school and doesn’t get a record now, he’s going to get one later—that’s all there is to it. If your child has been caught destroying property, speaking rudely or obscenely, or hurting someone at school, as a parent you need to deal with that very strongly. I think you need to find out the facts and then you need to let your child know very clearly that there are consequences at home for that kind of behavior. And the first consequence is, “We’re not going to fight with the school. You need to pay the price for your actions.” If your child has a fight in school and he’s suspended, for example, he ought to have consequences at home. I would recommend no electronics for the length of the suspension. He should not be suspended from school and then allowed to goof off at home all day. Make the suspension unpleasant for him. If it’s not unpleasant, it’s not going to shape his behavior. The whole theory behind consequences is that the memory of unpleasantness will shape the person’s behavior next time. So don’t undermine the school’s consequences by making the suspension a week of playing and vacation for your child. In this day and age, everybody is stressed and nobody’s got time. Parents are working harder than ever, and teachers have larger classrooms and more responsibilities. Believe me, if everybody had time and more resources, there would be a lot less friction between parents and schools. But that’s not the case, so we just have to live with that and figure out how to manage it the best we can. After all, we have the common goal of wanting our kids to behave responsibly and get an education. Schools have a legitimate interest in kids being compliant and respectful. Parents have a legitimate interest in kids getting an education and learning how to become independent. Parents and teachers should be on the same team, but sadly, often they’re not. There was a time when teachers and parents worked together—where if the teacher called a parent, the parent really worked on changing their child’s behavior. Kids were held accountable at home. It’s not often that way anymore. Now parents are often blaming of teachers and teachers are blaming of parents—and children play both ends against the middle. Kids can be highly manipulative in this area. I’ve heard a lot of stories about bad teachers. I’ve met one or two myself, but by and large, I believe most teachers are trying their best. The truth is, you have to really try to work with the teacher your child gets. If there is an issue, I recommend you go to that teacher and talk about it. And if that doesn’t work, then go to an administrator and try to set up some meetings. Just realize that the more adversarial the relationship between the parents and the school, the more your child is going to suffer—and the more they’re going to get away with. Don’t forget, when parents and teachers fight, nobody wins. And the end result is that your child doesn’t feel he has to change his behavior at all. If your child has been labeled a troublemaker and he has chronic behavior or attitude problems, it’s crucial that you are able to communicate with his teacher and the school. I think if you can develop a working relationship around a child who has these problems, it becomes a lot easier to support that teacher in his or her efforts. The bottom line is, that is what is best for your child. It may not feel best for your ego, but that is what’s best for your child. Is this a lot of work? Yes, it is. But I think parents need to try to find the time to do it. I know that sometimes I ask a lot of parents, but the fact is that kids need a lot of parenting nowadays. Communication and compromise are a huge part of parenting and working with your child’s school.